The Echigo-Tsumari Art Field is a fantastic and wonderfully impractical art space in Japan, where artists from around the world have scattered large-scale installations across 160 kilometers of land. In the midst of this art field is this set of giant colored pencils from Cameroon-born artist Pascale Marthine Tayou, titled “Reverse City:” enormous colored pencils hewn from trees dangle 2 meters above the ground, pointing down at the visitors below. 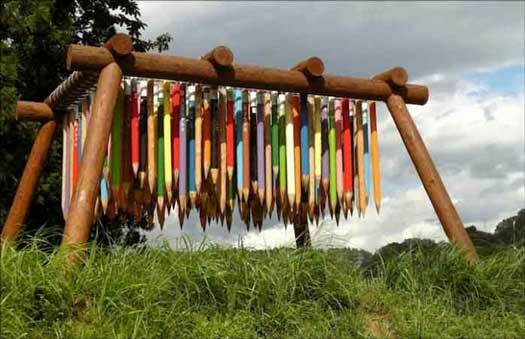 On each pencil is written the name of one of the countries of the world. The giant pencils are variously colored; some are short, some are tall…Suspended upside-down, the points of this colorful city are aimed at human visitors who, looking up at it, feel both awed and threatened. Los Angeles ranks second in the state in terms of the number of solar installations on residential, commercial and government buildings, with just over 4,000 projects installed. Los Angles is also second in the state in terms of the total amount of solar electricity generated, measured in capacity, with 36 megawatts. “The good news is Los Angeles is closing in on San Diego’s lead as America’s #1 solar city,” said Michelle Kinman. Every megawatt of solar power installed in the Los Angeles area prevents the emission of nearly 700 pounds of smog-forming pollution per year. A recent report by the Solar Energy Industry Association shows that California is home to over 3,500 solar companies that employ more than 25,000 people. In the past two years, Los Angeles has nearly tripled the amount of rooftop solar installations. From 1999 through 2009, Los Angeles installed just over 1,000 solar rooftop systems, totaling over 13 MW. Governor Jerry Brown has called for a significant expansion of California’s rooftop solar market by putting out a vision of installing 12 gigawatts (a gigawatt is 1000 megawatts, or twelve times California’s current solar rooftop market) by 2020. Los Angeles Unified School District at Richard E. Byrd Middle School in Sun Valley, which recently had a 362 kW solar system on a parking lot shade structure, which will save the District more than $1.6 million over the span of the 20 years and $60,000 in the first year. Los Angeles is also tops in the state (and country) for water conservation.